2 kg meats, 8 pieces of garlic, 2 spoons of black soya sauce, 4 spoons of light soya sauce, 2 spoons of oyster sauce, salt, MSG, 10 bowls (1.5 litre) of water and two packets of A1 Soup Spices (35g). Reduce half of the above ingredients if only 1 kg of meat is used. Storage Condition: Keep away from direct sunlight and store in a cool and dry place. Ingredients: Cinnamon (15%), Angelica Pepper (12%), Aralia Cordata (10%), Sinensis (10%), Star Anise (10%), Pauranti (10%), Cigusticum (10%), Radix Rehmanniae (10%), Rhizoma Atractylodis (5%), Liquorice (5%), Rhizoma Lingustic (3%). 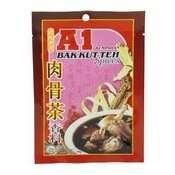 Simply enter your details below and we will send you an e-mail when “Bak Kut Teh Spices (肉骨茶)” is back in stock!